Gold is trading at USD 1,759.10, EUR 1,305.60, GBP 1,116.30, CHF 1,618.20, JPY 135,390 and CNY 11,190 per ounce. Gold’s London AM fix this morning was USD 1,756.00, GBP 1,115.70, and EUR 1,304.12 per ounce. Yesterday's AM fix was USD 1,773.00, GBP 1,124.43, and EUR 1,311.49 per ounce. 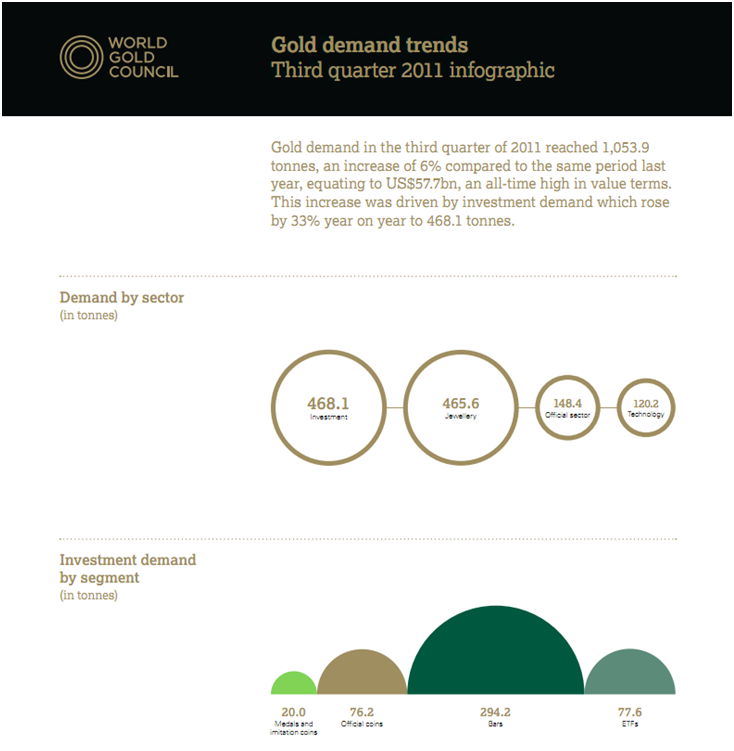 Gold Demand Trends (Q3 2011) released today by the World Gold Council (GoldCore Research Section) shows that investment and central bank demand for gold were key drivers of total gold demand last quarter. Third quarter gold demand increased 6% year on year to 1,053.9 tonnes with investment demand rising a significant 33% y/y to 468.1T. Virtually all markets saw strong double-digit growth in demand for gold bars and coins. Investment demand in Europe surged 135% due to the deepening sovereign debt crisis. Significantly, 390.5 tonnes of the 468.1 tonnes of investment demand went into physical bullion in the form of bars and coins. ETF demand was 77 tonnes and nearly 50% of that was from European investors and institutions. The increase in overall investment demand was quiet impressive considering the higher average price in the quarter and the price correction in September but not surprising given the scale of the global economic crisis. A huge and paradigm shift change in the gold market is central bank buying which rose 556% to 148.4T from 22.6T in Q3 last year. For the past 15 years there has been net selling of around 400 tonnes per annum from central banks. Importantly, the World Gold Council can only identify about 40 to 50 tonnes of the 148.4 tonnes bought by central banks. The WGC note that "additional purchases were made by a number of countries' central banks, which cannot currently be identified due to confidentiality restrictions". Central banks do not have to reveal immediately who purchasers are. The fact that there is 100 tonnes of new central bank buying that is unaccounted for is not surprising to GoldCore and analysts who have long been saying that the People’s Bank of China and other central banks are likely continuing to quietly and gradually accumulate large quantities of bullion. They are not declaring their purchases due to concerns that this may further devalue their currency reserves which are mostly in US dollars and also in euros and would result in them having to pay higher gold prices for their new gold reserves. Central bank gold demand and unaccounted for central bank gold demand is very bullish for the gold market and has barely been reported on in the non-specialist financial media. Also of note was the fact that Chinese jewellery demand surpassed India – which has only happened in 4 quarters since January 2003. Chinese gold demand in the first 3 quarters is now already ahead of last year entire demand for 2010. It is important to note that while the total gold demand figure of 1,053.9 tonnes in Q3, 2011 sounds like a lot, it is actually very small in investment, foreign exchange and financial terms as it is worth just $57.7 billion. Total global investment assets are estimated to be over $200 trillion. Average daily turnover in global foreign exchange markets is estimated at over $4 trillion. Russia’s Sberbank, a bank many will not have heard of, has a market cap of $60 billion. Gold remains a negligible part of the world’s investment and financial universe and remains under owned by savers, investors, institutions and central banks internationally. This latest report which can be read here shows that this is changing but the increase in demand continues to be from a very low base. Given gold’s proven risk mitigation, hedging and safe haven properties, it is likely that savers and investors will continue to seek protection from economic uncertainty. This uncertainty shows no signs of abating and indeed appears to be set to deepen in the coming weeks and into 2012. Scaring investors from diversifying into gold by comparing the gold market today to the 1970s boom and bubble burst continues to be unfortunate and imprudent. It is a simplistic theory propagated by the biased and by those who have not bothered to inform themselves about the gold market. Platinum is trading at $1,602.20/oz, palladium at $630.00/oz and rhodium at $1,600/oz. 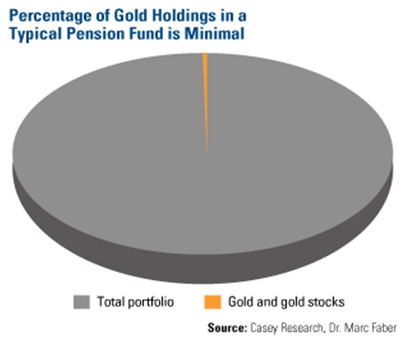 Is GLD Really As Good As Gold?